I sat on a heated toilet seat yesterday. It wasn’t the highlight of my Alaska vacation but, coming in from the cold, it was memorable nonetheless. Greg and I are in Anchorage visiting family. The ways Alaska differs from my home of Barbados are stunning, stretching far beyond facilities in the loo. 1. Size. Barbados is 14×21 miles in size, the 14th-smallest country in the world. The state of Alaska could cover 20% of all the rest of the United States, twice the size of Texas. 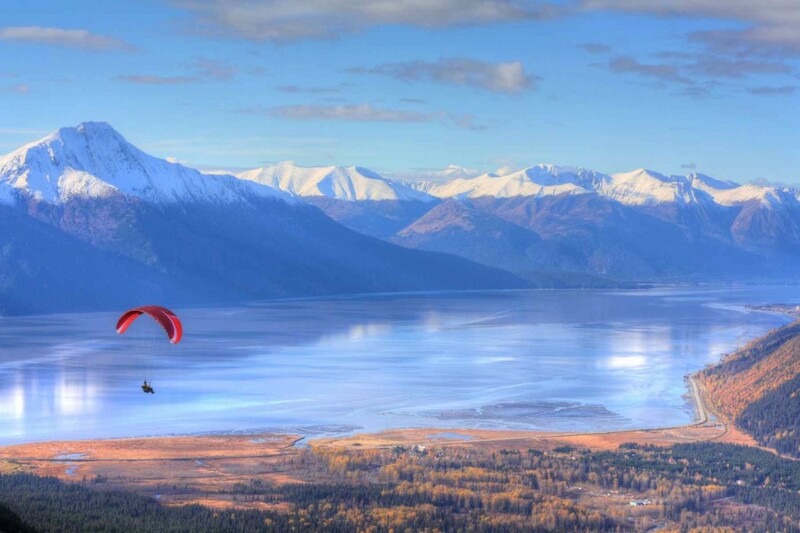 If Alaska were a country, it would be the 18th largest in the world. Alaska differs from Barbados in very large ways. I took this photo at Alyeska, Alaska. 3. Size & height of animals. Our largest animal in Barbados may be our green sea turtles, which grow to 4 feet in diameter and weighs around 300 pounds. Our sea turtles are gentle and magnificent creatures. And very petite when compared with the female moose and her calf I came nose to nose with yesterday in my aunt’s front yard. A baby moose reaches 300-400 pounds by its first winter. Its mum is around 900 pounds. If its pop had been there he’d have weighed in at 1200 pounds. Or so. They can be as hefty as 1800 pounds. My cousin John killed a moose recently; there’s enough meat to feed his family of four for two years. 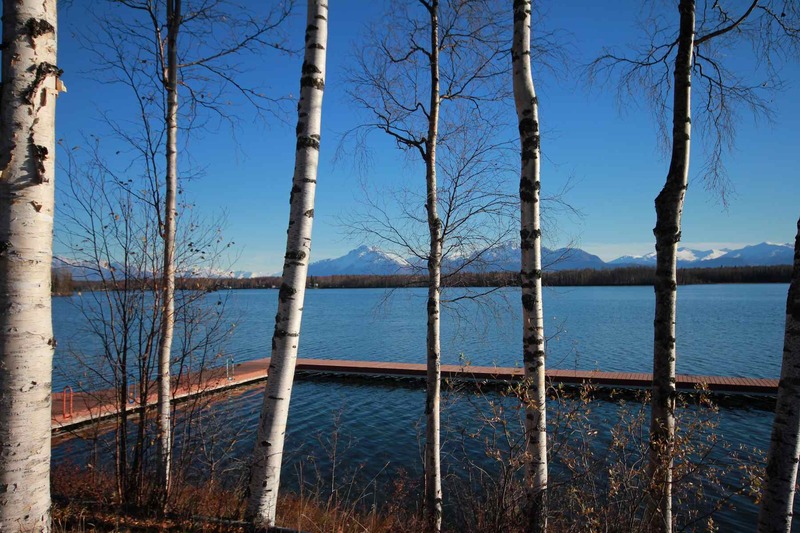 Sarah Palin country; the Palins live on this lake in Wasilla, Alaska. 1. Colorful characters. 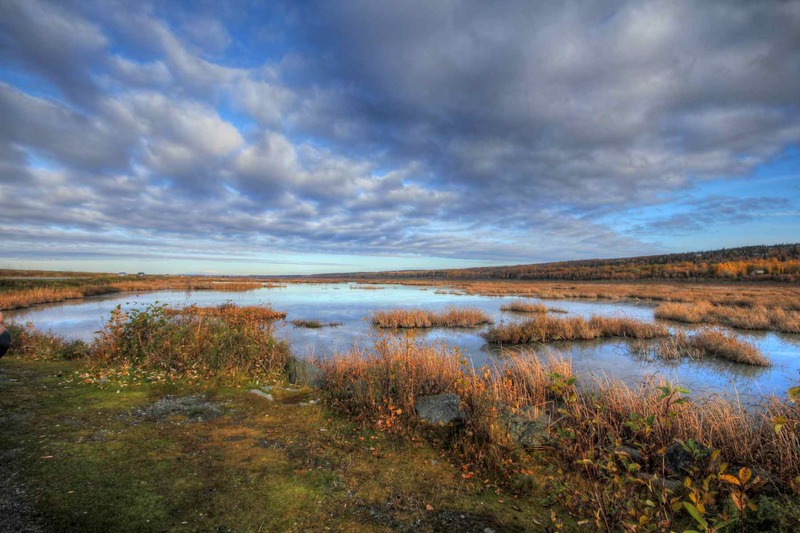 Some individuals are as much a part of the landscape in Alaska as the rugged mountain backdrop – namely, the “mountain men,” with long beards, flannel shirts, work boots, and Leatherman multi-tool hanging from a belt loop. My aunt Jean tells me that the women who come to Alaska because “the odds are good” need to be careful because sometimes the “goods are odd.” In Barbados, we have our Rasta guys – no beards, but very long hair. Individuals, although I’m not sure they’ve earned a colorful saying. 2. Amazing fresh fish. The Alaska salmon is the deep color of – well, of salmon, and absolutely delicious. I’ve also eaten moose and reindeer sausage here in Alaska, both way better than I might have imagined, although if I lived here I wouldn’t make a habit of eating Rudolph. The local food in Barbados that was wiggling just moments before their expert preparation includes mahi mahi, barracuda, flying fish, red snapper, more … ahhh! 4. The setting is mind-blowingly beautiful. Today, my last day in Alaska, I’ve come to feel that the two are as different and yet as similar as two siblings in a family. Alaska is cold, vast, majestic, defiant. A magnificent giant. She’s held court for some 150 million years and looks down on man patronizingly. Barbados is warm, small, and intimate. Cozy. And young, just 1 million years old. Barbados needs man to protect her. Alaska and Barbados are a David and Goliath who co-exist peacefully and offer their natural gifts to us freely. It’s up to us not to mess up God’s magnificent work. Enjoy life, all. Thanks for your comments. I always enjoy hearing from you. Along the road to Alyeska, Alaska. Your observations and comments about Alaska are fun and ‘right on’. There are some amazing similarities between Barbados and Alaska, as we discovered in our converations. The main one, I think, is that the people who adapt to the areas, are happy and upbeat about their choices. And though we both are ‘isolated’-needing air transport mainly to change the view, we don’t feel isolated. Though most our food is flown in, we feel we are able to have so many choices. And We are fortunate to have good medical care and educational opportunites that keep our minds active. So, I recomend that a visit to either place is a worthwhile endeavor. Thank you, Jean. You’re right: Despite our both being far from big cities, neither you nor I feel isolated. In fact, that’s one of the main draws of both Alaska and Barbados — they’re far away! Thanks for writing .. and especially for being the most amazing host to Greg and me. Now that we’re out of your hair, you can get back to the masterpiece you’re painting for your solo show in December! !